I tried to fuse might&magic elements from Hexen with grunge&tech elements from Quake to form rather unique mapstyle. I'll work more, since I believe that mapstyle is matter of personal preferences (some1 will like it, some1 won't), and I'm 90% satisfied with layout. 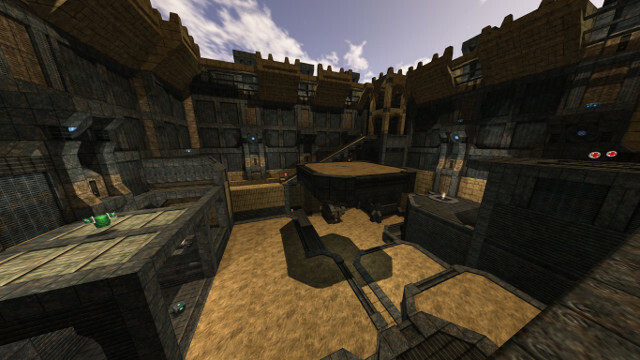 I want to implement this to my future Duel and CTF maps, because only around 5 maps are used for duels, which are 3rd most played 'gamemode' in Sauer at the moment (below InstaCTF, Insta). So, more maps coming soon, and same description applies for Reptile 2a. :) This is remake of my 4th map ever, called Sugar Turbine, which was colourful sugar factory. After seeing the same theme (but different executed) again, I would like you to read Basic Mapping Guide Oriented on Gameplay. After you've submitted these maps in a short period of time, there are some habits which frequently appear on the maps. I know they still are very unfinished, but perhaps the Advanced Mapping Guide Oriented on Gameplay might help also.